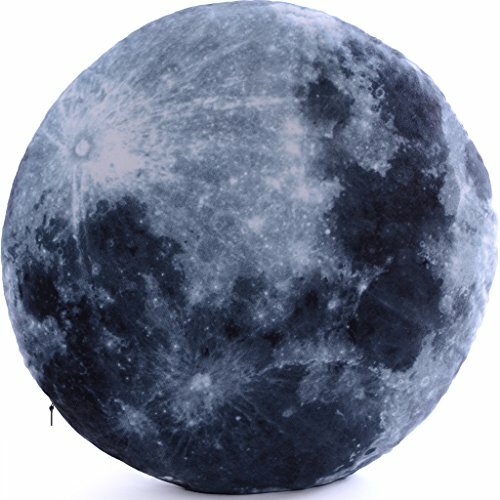 Vercart (TM) - 3D Analog Moon Pattern Style Decorative Throw Pillow Creative Home Decoration Cushion 18"x18"
Made From Quality Short Plush Polyester Fabric, Natural Eco-Friendly Materials. Are They Stones? No, They Are Soft Cushions Which Were Designed to Resemble Stones Style. These Vivid Pillows Cushion Can Be Used as Properties Props in Photostudio, Also Can Be Used as Floor Cushions, Throw Pillows, Couch Pillows, Wedge Pillows, Sofa Pillows to Decorate Your Home, Garden and Kindergarten. Spoof Toys in Party, Soft Chairs When Outgoing, Picnic and Barbecue, Kids' Toys, Plush Toys and Lots Other Purpose. Think How Cool It Would Be When Children See Them in Your Home, in Your Garden or Child-Centers. The Fabric Short Plush Polyester Fabric of the Cushion Is Environmental, Very Soft And Cozy. It Has Been Proved to Be Safe for People's Health Even for Babies. If you have any questions about this product by VERCART, contact us by completing and submitting the form below. If you are looking for a specif part number, please include it with your message.